Client of the Month - Congratulations Anna Mead! Training Frequency: Anna trains with us 3x/wk doing PACK (small group training) Cardio Frequency: She runs 1x/wk on her own and 1x/wk with us on the weekends as well as 20-30mins of cardio after her workouts. Nutrition: Applying the principles she learned from our Nutrition Together program, Anna's aim each day is to eat enough calories as recommended to support her goals and to eat a balanced diet of whole foods including lean protein and/or fiber at each meal. Together we set specific, measurable, and realistic goals each week to keep her focused and on track! Anna first joined Fitness Together to get help and guidance in running her first 5k, the Dana Point Turkey Trot. She not only ran and completed it like a boss, but has gone on to run several other races since then and is now looking to complete a 10k in the near future. When asked what she thinks has improved the most since working with Fitness Together, she said "FT has helped with my endurance, strength, and overall health." 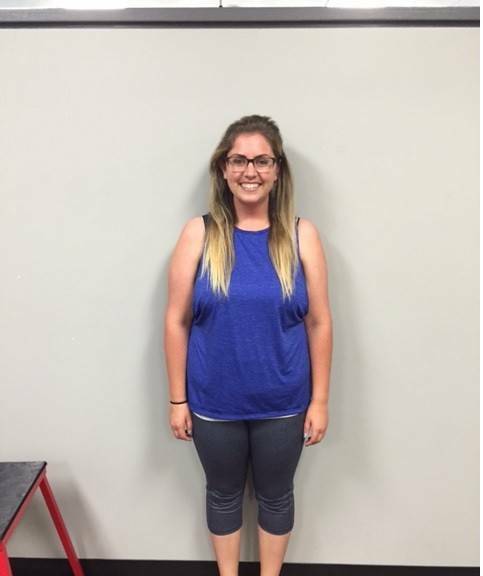 She began working out with us in October and has since decreased her body fat by 30lbs, lost over 26 inches including 5.5 inches off the waist, and has gained 7.5lbs of lean muscle! "Besides all the physical changes, FT has helped me uncover self-confidence I never knew was there", says Anna. We're all so proud of you Anna! Keep up the hard work!! !